The photo on the card shows a boy who was found murdered, a year ago, on the grounds of a girls' boarding school in the leafy suburbs of Dublin. The caption saysI KNOW WHO KILLED HIM. Detective Stephen Moran has been waiting for his chance to get a foot in the door of Dublin's Murder Squad—and one morning, sixteen-year-old Holly Mackey brings him this photo. 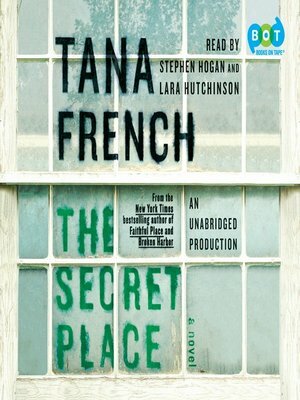 "The Secret Place," a board where the girls at St. Kilda's School can pin up their secrets anonymously, is normally a mishmash of gossip and covert cruelty, but today someone has used it to reignite the stalled investigation into the murder of handsome, popular Chris Harper. Stephen joins forces with the abrasive Detective Antoinette Conway to find out who and why. that bound all the girls to Chris Harper. Every step in their direction turns up the pressure. Antoinette Conway is already suspicious of Stephen's links to the Mackey family. St. Kilda's will go a long way to keep murder outside their walls. Holly's father, Detective Frank Mackey, is circling, ready to pounce if any of the new evidence points toward his daughter. And the private underworld of teenage girls can be more mysterious and more dangerous than either of the detectives imagined.